The House Budget Committee chairman is so determined to advance his austerity agenda that he’s talking about abandoning commitments to Americans nearing retirement. Remember when, in the 2012 vice presidential debate, Paul Ryan was asked about his plans for Medicare? Ryan said that, yes, he “absolutely” wanted to “reform” Medicare. He was less specific about the fact that his favored reform, a so-called “premium support” scheme, rejects basic premises of the popular program and restructures it as a voucher experiment. When he was his party’s nominee for vice president, Paul Ryan sought to address voter concerns about that abandonment by promising not to mess with retired Americans or with Americans who are near retirement age. Indeed, says a House Republican who attended a closed-door meeting with Ryan Monday, the Budget Committee chairman has told colleagues that, in order to balance the budget over the next decade (as his new plan will propose), he might have to adjust the age as high as 59. 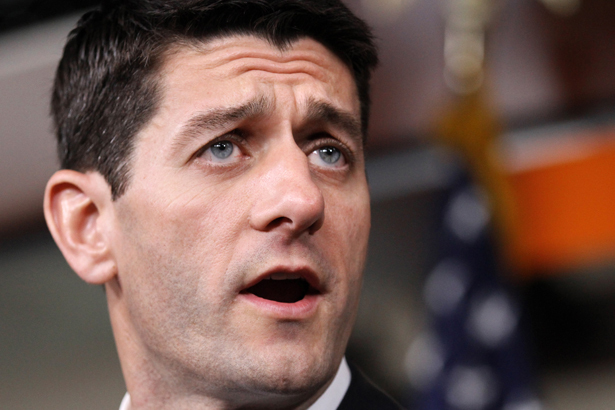 “Paul Ryan was pretty clear that that could happen. You could have to take it up to a higher number like 56, 57, 59… it could be higher than 55, but he also said, ‘We don’t have any numbers yet,’ ” the Republican lawmaker told The Hill. What this suggests is that, in order to initiate the European-style austerity agenda that Ryan and many top Republicans now appear to be determined to bring to America, they are entertaining proposals that could upset the retirement plans of millions of Americans who had been planning to rely on traditional Medicare coverage in their retirement. That’s a radical change, and a daunting one, especially for workers in the 55–59 age range, who are already well into planning for retirement—which on average occurs around age 62. Those workers, battered by the economic meltdown of 2008 and in many cases struggling to pay for the education of children and the care of elderly parents, are already squeezed. And Paul Ryan appears to be interested in squeezing them more. Medicare alone provides health care to 40 million American seniors and more than 8 million Americans with disabilities—and does so at a fraction of the cost of private insurance. Inevitably, we are going to be asked about the rising cost of health care. We should welcome this conversation. Allowing Medicare Part D to negotiate lower drug prices for seniors—just like the Veterans Administration already does—will save more than $150 billion over 10 years. But cutting benefits has nothing to do with cutting health care costs, and actually increases costs for seniors. Raising the retirement age for Medicare would cost our own family members over $2,000 and increase health care costs by over $11 trillion. So what’s Ryan thinking? Actually, he’s not thinking about saving Medicare. He’s thinking about advancing the austerity agenda of the “Fix the Debt” crowd that keeps proposing to “reform entitlements” at the same time that it is seeking to lower top marginal tax rates for the wealthiest Americans and the largest corporations. That’s an easy sell on Wall Street. But a tough one on Main Street. House Republicans in vulnerable districts are already crying foul, noting that they sought election on a promise not to mess with the plans of Americans nearing retirement—the same promise Ryan made in the debate. Their concerns could cause Ryan to temper some of his plans—at least publicly—as he rolls out his latest budget proposal. Yet, every evidence is that Ryan is determined to mess with Medicare—even if the move is politically charged. Tea Party “deficit hawks” want to do so. And so does Ryan’s core constituency. No, not the voters back home in Wisconsin. Nor even the Republicans who might entertain a “Ryan for president” run in 2016. Insurance companies that certainly have an interest in those “premium support” vouchers provide a lot of campaign contributions to Paul Ryan. According to the Center for Responsive Politics, donors with insurance company ties were number three on the list of top contributor’s to Ryan’s 2012 congressional campaign, right after donors from the securities and investment industry. Perhaps the theory is that, with enough campaign money, it will be possible to convince members of one of America’s highest-voting age demographics that they don’t mind having their retirement plans sacrificed on the altar of austerity. If that’s the gamble, Ryan would do well to remember that when the voters who had elected and re-elected him to the US House by wide margins in elections from 1998 to 2010 got a sense of his plans for Medicare in 2012, they weren’t impressed. Not only did Ryan and Mitt Romney lose nationally, they lost in Ryan’s home state of Wisconsin, and Ryan the congressional candidate recorded the worst finish of his career. Even after he sugar-coated his proposals for election audiences, Ryan lost his home precinct, his hometown and his home county to a candidate who promised not to mangle Medicare. Far from stiffing seniors, it’s time to tax financial transactions, Katrina vanden Heuvel writes.